Though Microsoft hasn't been too chatty about sales of Windows 8, there have been a few signs the operating system is no hot cake analog. Another crack in the OS's armor showed Wednesday, as supporters of the OS are starting to grumble. It seems things are a little too slow for Asustek Computer's Chief Financial Officer David Chang. "Demand for Windows 8 is not that good right now," Chang plainly told the Wall Street Journal. Though the chief didn't give the Journal any sales figures, he said ramp-up for Windows 8 touch notebooks has been pretty slow. Considering that Asus's VivoBook is one of the best selling Windows 8 laptops on Best Buy's website, that might spell trouble for the new OS. Microsoft was shy to share any hard numbers on Windows 8, until Tuesday. It was then the company said it has sold 40 million Windows 8 licenses since it went on sale Oct. 26. That means Windows 8 adoption is outpacing Windows 7, but take that announcement with a grain of salt. The unofficial metrics of Windows 8's sales have been less rosy, and a few surveys have shown the public isn't flocking to the upgraded OS. Avast, a PC security company, polled about 135,000 of its users and found that 70 percent of respondents don't plan to upgrade to Windows 8. Another poll by web analytic firm NetApplications showed that Windows 8 has only captured about 1 percent of the global desktop market as of last week. The poll also suggested adoption percentages of Windows 8 Touch and Windows 8 RT are even worse. What's more, the Touch version has control of 0.2 percent of the tablet market share, where RT has basically zero, according to the poll. That's not great considering Windows 8 Touch was intended to help Microsoft get a foothold in the tablet market. In the Wall Street Journal's report, both Asus and rival computer maker, Acer, declined to give sales figures for Windows 8 machines, which suggests there isn't much to crow about. Asus has yet to oblige TechRadar's request for comment or updated sales numbers. So even if Windows 8 sales are humming along, it seems like the OS's touch laptops aren't selling too well. That could explain why laptop manufactures seem a bit miffed. However, as suggested by the Wall Street Journal, the only way up for Windows 8 Touch is down- meaning lower prices. An internal email from an Acer manager suggests that prices for Windows 8 touchbooks are a little too high to gain traction. It says that lower priced touchbooks, like Asus' VivoBook (which costs $479.99, UK£449.99), will help make the new touch-optimized OS more popular. Analyst Christine Wang echoed the sentiment, saying one of Windows 8's biggest challenges is price. 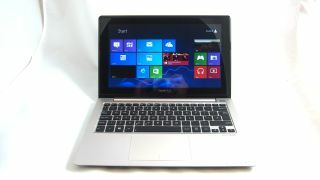 The touch technology packed into the large and thin Windows 8 notebooks have made them too pricy to appeal to consumers. Demand, she said, should steadily pick up when prices come down. As of a month after release, determining whether Windows 8 is succeeding is still a bit murky. It's safe to say the operating system didn't set the world on fire as Microsoft had hoped, and the company must be a bit disappointed. But we'll have to get a few more jig-saw pieces before we can get a better picture of the new OS's success or failure. Microsoft, by the way, held its annual shareholder meeting today, where CEO Steve Ballmer offered some optimistic though non-specific facts on Windows 8 growth.